Vue CLI 3 is the latest version of the Vue Command Line Interface. Throughout this tutorial, we are going to learn to use the Vue CLI 3 (In beta — 3.0.0-beta.15 as of this writing) to generate our Vue front-end application. How to install and add Vue CLI plugins manually etc. The Vue CLI v3 provides a new experience to developers as it allows you to easily generate new Vue projects with zero initial configuration but once your project needs more control you have the possibility to add more configuration options using plugins. Unlike create-react-app, you can customize your configuration without ejecting but only via Vue CLI plugins. Zero configuration rapid prototyping via @vue/cli and @vue/cli-service-global. A runtime dependency (@vue/cli-service) that provides many features: It's upgradeable, built on top of webpack, has sensible defaults, configurable via in-project config file, extensible via plugins etc. Official plugins to support using powerful existing tools in the front-end ecosystem. So you don't need to eject webpack in order to customize your project's configuration. This will install the Vue CLI 3 globally on your system so depending on your npm configuration your may need super-user access i.e add sudo on debian-based systems. Vue is using scoped packages for various packages such as the cli using the @vue namespace. You'll be asked for various features such as TypeScript support, adding the Vue Router, adding Vuex etc. Choose the features you need in your application and press Enter. Wait for application to get generated and for packages to install before you can use your newly created Vue application. Using your web browser, you can navigate to http://localhost:8080/ to see your Vue application up and running. package.json: Required for each Node.js module. It contains project's meta information and dependencies. public: This is a folder that contains public assets such as index.html and favicon. src/main.js: This file contains the initialization or bootstrapping code of our application. src/App.vue: This file contains the main component of our Vue application. src/assets: It contains the static assets. src/components: It contains the components of our Vue application. The Vue CLI v3 provides many other npm scripts (build and lint) which setups zero-configuration development and production environments with various features such as hot code or module reloading, concatenation, minification and linting etc. All scripts use the vue-cli-service which has ready webpack configurations for development and production so you don't have to deal with Webpack when you are just starting to work with your project. Your environment variable should start with VUE_APP_. The Vue CLI will load your defined environment variables and make them available via process.env. For example, you can access the VUE_APP_DEBUG variable via process.env.VUE_APP_DEBUG. Environment variables defined in .env will be overridden with the same variables if they are defined in .env.development or .env.production etc. Sometimes, when making API calls from your Vue front-end application, you'll need to use a proxy to proxy calls in order to avoid issues such as CORS related to Same Origin Policy enforced by web browsers. Vue CLI v3 provides a built-in feature to use a proxy. So if you need to make API calls to Django server running at http://localhost:8000 you simply call http://localhost:8080/api/* and Vue CLI will take care of forwarding the calls to http://localhost:8000/*. The Vue CLI relives you from manually dealing with Webpack configuration by providing plugins for configuring many features and dependencies. But, in many situations, you'll want to have access to the Webpack configuration file for making advanced things not available via a CLI plugin. 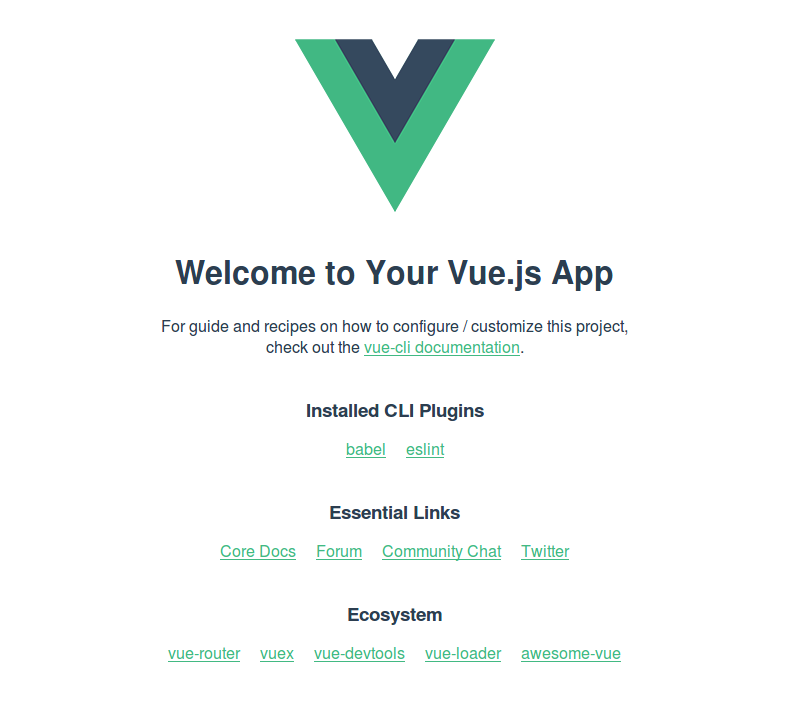 In this tutorial, we've seen how to install the Vue CLI 3 and various features such as adding plugins, adding environment variables and proxying API calls.